Nineteen eighty three was quite a year for Clive Sinclair. It began with his company passing the million-computer-sales mark and by the end of the year he had been knighted, his flat screen pocket TV had been launched and orders for the ‘Quantum Leap’ computer were about to be sought. 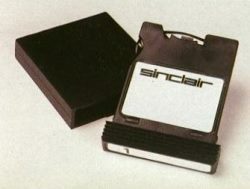 During 1983 the family of Sinclair peripherals for the Spectrum grew. Interface One arrived, which allows up to eight Microdrives to be connected to the Spectrum — as did the Microdrives themselves, a cunning concept which has only recently been perfected. Interface One incorporated an RS232 interface, which permits the Spectrum to communicate with the outside world — to a printer, down a phone line or to up to 64 other Spectrums linked together in a network. Sadly the Interface One RS232 was a bit of a bodge, involving a trivial bit of hardware with most of the work involved in building characters from discrete audio clicks and vice versa being done by software. A proper RS232 interface needs to be hardware driven to send and receive data at the same time, and is capable of transmitting and receiving information over the phone using a modem. You can talk to other computers via an Interface One, but don’t expect to be able to listen at the same time! The ZX Net, using Interface Ones to link Spectrums together has never really been utilised fully. The potential for multi-user games is definitely here — the only reason why a dozen people can’t link their Speccies together and play Multi User Dungeon in the same room is because no-one’s written the software. Yet. 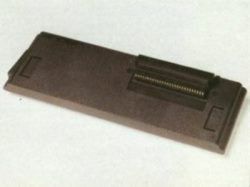 The Microdrive itself works on the same principle as the old eight track audio tape cartridge — a continuous loop of tape is cunningly packaged in a cartridge and forms a floppy tape data storage and retrieval system. The idea was good, made possible in such a miniaturised form by the advent of high-quality magnetic tape developed for video recorders. But Microdrives rapidly acquired a reputation for unreliability. One main source of problems lies in the fact that the tape loop is expected to do a standing start. Access a file on Microdrive cartridge and the poor little beast attempts to start reading immediately and shift the tape past the read head at the correct speed instantaneously. Microdrives used on ICL’s One Per Desk machine (and, it is rumoured, on later QL’s) have a run up and run down time, which allows the tape to accelerate to running speed before reading commences. At five pounds per cartridge the floppy tapes themselves were painfully expensive until very recently, when the price was halved. Despite the fact that Sinclair Research would duplicate software onto microdrives for free, software houses couldn’t really see too much point in spending so much to put their games onto Microdrive when a 48K program can be duplicated on cassette for less than 50p a unit. Now that the cartridges have come down in price — and will be sold to One Per Desk and QL users too, no doubt, Spectrum software could start appearing on Microdrive. Incidentally, there are two types of Microdrive cartridge — those made more recently are much more reliable in use than their predecessors, and have the words ‘Regd Design App’ embossed on their edge. So now you know what to look for! Interface Two, the joystick and ROM cartridge interface, which sells for £20 was released rather late. Given its price and the timing of the launch it was never likely to catch on in a big way. All it contains is one elementary address decoding chip and a few wires, and while it does offer the advantage of allowing you to use a ROM cartridge to run programs, only a handful of games have ever been released on ROM. Once again, software houses couldn’t see the point of investing in expensive cartridges. Cartridge-based versions of cassette software invariably cost the consumer at least twice as much as the tape and it seems clear that people weren’t prepared to pay so highly for the benefit of instantaneous loading. Anyway, Interface Zero was dreamt up by one enterprising fellow of our acquaintance who wrote a magazine article explaining how to hard-wire a joystick into the guts of a Spectrum. The total cost of Interface Zero was about 0.5p’s worth of electrickery used to warm up a soldering iron and about an inch of solder to make the joints. Somehow Sinclair Research was left behind in the race to interface joysticks to the Spectrum. 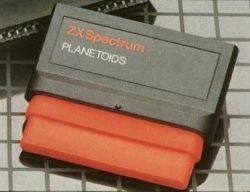 By the time the Spectrum was launched, a goodly number of firms were already making a healthy living supplying software and hardware add-ons for the ZX80 and ZX81. Naturally, they jumped on the Spectrum bandwagon as soon as it started rolling and joystick interfaces of varying degrees of sophistication appeared soon after the machine’s launch. They were soon followed by alternatives to the standard issue ‘dead flesh’ keyboard. A few sleepless nights were caused in add-on keyboard circles when Interface One appeared, as most independent keyboards had to be modified with a saw before they could be connected, and no doubt a few more anxious moments were caused by the advent of the Spectrum+ just before Christmas last year. For some £20, the Spectrum+ keyboard can be bought from Sinclair as an upgrade kit, and for the price it’s not a bad deal. As a keyboard, however, it’s not ideal for every purpose, and there will still be room for independent keyboard manufacturers for a while yet. All Spectrums sold from now on will be Spectrum+s, however, and the add-on keyboard market is a finite market. The peripheral market grouped round the Spectrum is still healthy overall, with a variety of manufacturers providing a wide range of add-ons which improve on the basic machine. Sound synthesizers, programmable joystick interfaces, sound samplers, printer and monitor interfaces as well as disc drives are all available and there seems to be no shortage of ideas. Throughout 1983 and 1984 Spectrum sales boomed and software houses catering for games playing Spectrum owners ‘never had it so good’ to borrow a phrase. Early in 1984, too early in many people’s opinion, the QL was launched. After four years committed to the Z80 family of processors, Sinclair moved towards the 68000 family and the jump involved, together with the overly ambitious launch schedule for the QL led to a flurry of bad publicity for Sir Clive. Fully working QL’s, from stock, have only recently become available. The first half of this year has not been overly kind to Sir Clive Sinclair or to a number of companies active in the Spectrum hardware and software market. After the Christmas boom in sales, occasioned partly by the six-pack offer and partly by the £50 price cut, tens of thousands of Spectrums were left in the shops. More than a few retailers felt they had been given a raw deal when they found their stocks of ‘old’ rubber keyed Spectrums were unlikely to sell very easily now the Spectrum+ shared the same retail price. Both hardware and software houses have disappeared since Christmas, dashing lemming-like into liquidation. Bug-Byte, Quicksilva and Prism, three of the industry’s mainstays have effectively disappeared (Quicksilva being taken over by Argus Press), and a whole host of lesser stars in the Spectrum support market have recently come crashing down. The City seems to have lost confidence in the home computer market as a whole, Sinclair shares have fallen in value, Sinclair Research has cancelled production of the Spectrum because it’s holding stocks apparently in the tens of thousands and the C5, launched this year by Sinclair Vehicles, has also had production cut right back. A temporary set-back for Sir Clive? Well, he’s seeking capital to set up a factory making wafer scale integration chips, has plans to produce a complete range of electric vehicles before the end of the century and should be launching a new portable computer in the not too distant future. Fear not. The Spectrum is far from dead — expect to see a Spectrum-based portable machine with a flat screen display battery power pack and wafer drive memory before too long. Codenamed ‘Pandora’, the Spectrum Portable project could see a lot of exciting things coming out of the box! Next month, by way of digression, we’ll take a gentle break from computers with a look at the C5 and Sinclair’s flat screen TV. Hang on in there Sir Clive!